Childhood is the best time, a time when children run, play and grow. During these formative years body demands an intake of vitamins and minerals which are present in fruits and vegetables. But, children with less appetite and fussy eaters lack these components which are required for the optimal, physical and mental growth. Reassure Junior is a balanced nutritional supplement with all the essential vital nutrients, vitamins and minerals necessary for the overall development of the child. Sucrose, maltodextrin, high oleic sunflower oil, sodium caseinate, soy oil, medium chain triglycerides (MCT) oil, MINERALS (calcium phosphatetribasic, potassium citrate, magnesium chloride, potassium phosphate dibasic, potassium chloride, sodium citrate, ferrous sulfate, zinc sulfate,manganese sulfate, cupric sulfate, chromium chloride, potassium iodide, sodium molybdate, sodium selenite) whey protein concentrate, flavouring (vanilla), VITAMINS (choline bitartrate, ascorbic acid, ascorbyl palmitate, niacinamide, dl-alpha tocopheryl acetate, Vitamin A palmitate, d-calcium pantothenate, thiamine hydrochloride, pyridoxine hydrochloride, riboflavin, folic acid, biotin, phylloquinone, Vitamin D, cyanocobalamin), soy lecithin, m-inositol, taurine and l-carnitine. Reassure Junior, a nutritional supplement, increases the appetite of the child. This is an ideal drink for children recovering from illness, delay in development, fussy eaters and undernourished children. It has all the 34 vital nutrients that help the child grow physically and mentally strong. It is also free from gluten and lactose. It supplements him with all the required vital nutrients thereby assuring the growth and development. To prepare a 225 ml feeding, put 190 ml of water in a glass. Gradually add 5 level scoops (enclosed) or 45.4 g of Reassure junior Powder, while stirring and mix until dissolved. 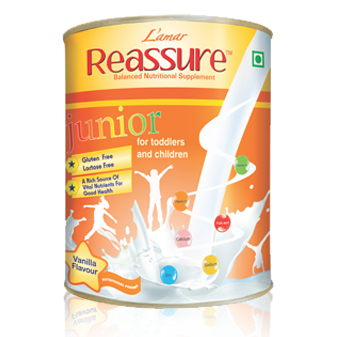 When mixed as directed, Reassure junior provides approximately 1 kcal per ml. It tastes great when mixed with milk too. Also available in delicious Chocolate and Strawberry flavours.